Internet connectivity still lags on the continent. 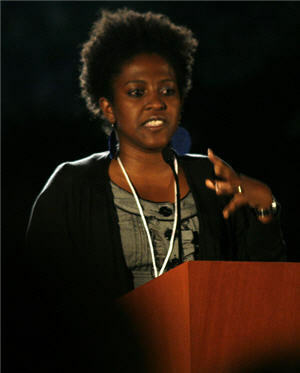 Google is hoping the creator of Ushahidi, Ory Okolloh, will help it make inroads. Much of the coverage of Google focuses on its domestic priorities–its rivalries with Microsoft, Apple, and Facebook, its friendship with Verizon, its interest in net neutrality. But less well covered has been the tech giant’s efforts overseas, particularly its focus in the past few years on expanding Internet usage in places where it trails, like Africa and the Middle East. Google just scored a coup in moving those efforts forward–by hiring Ushahidi’s founder and director to become its manager of policy in Africa. You may know Ushahidi as the open-source platform for crowdsourcing information, created following the 2007 Kenyan elections as a way for people to report incidents of violence. The woman behind it was 33-year-old Ory Okolloh, a Harvard-trained lawyer who had previously created a site to monitor corruption in the Kenyan legislature. Though she’s most famous for her work on Ushahidi, Okolloh has also worked as a corporate lawyer for an organization that supports entrepreneurs in South Africa. She once turned down a six-figure gig at Covington and Burlington because, she told a TED audience, her passion lay in her home continent, and that was where she was needed. Google’s interest in Africa is not new. Its Google Africa Blog launched in the summer of 2008, it developed tools designed for the unique needs of people living in the sub-continent, and it’s tried to spur the development of “locally relevant digital content.” And last year it began its G-Africa Initiative for software developers, marketing professionals, and entrepreneurs. E.B. Boyd’s coordinates: Twitter, email.